What's New? by Tim Finkle: Another trip down to Newport, this time for the annual Newport International Boat Show. This is a combined sail and power show and the attendance was very good. We don't attend every year, but our brands Beneteau, J/Boats, and Back Cove were all there, with several new models, so we decided to attend. The new outboard version Back Cove 34"O" was there and Corbo wrote about it in the articles section. 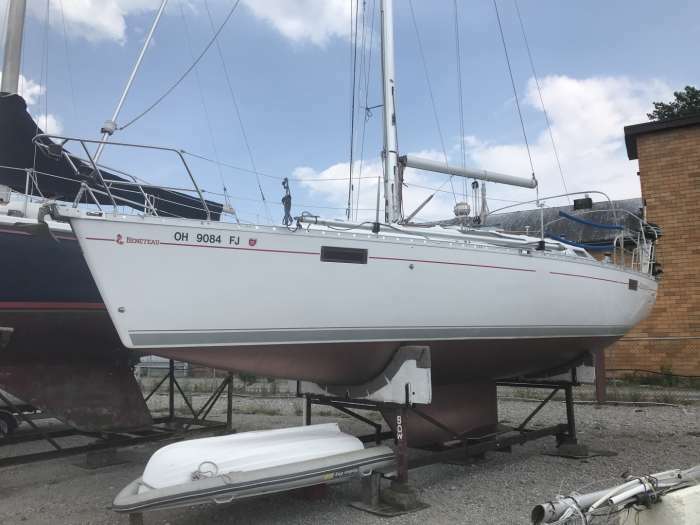 Corbo recently sold his Back Cove 30 to make room for a 34O that he has ordered for next spring. 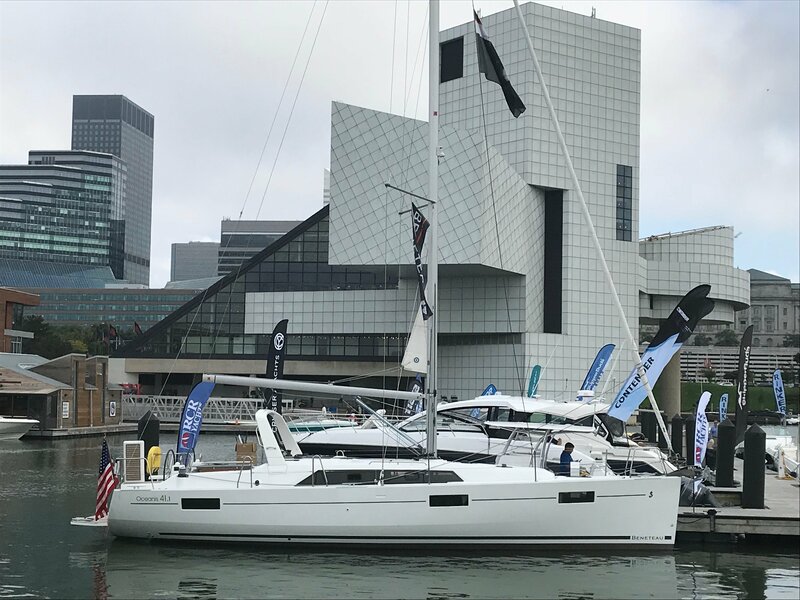 At the same time last week, our Ohio guys Mark and Dave were at the Cleveland Show at Rock n Dock Marina, right down town beneath the Rock n Roll Hall of Fame. 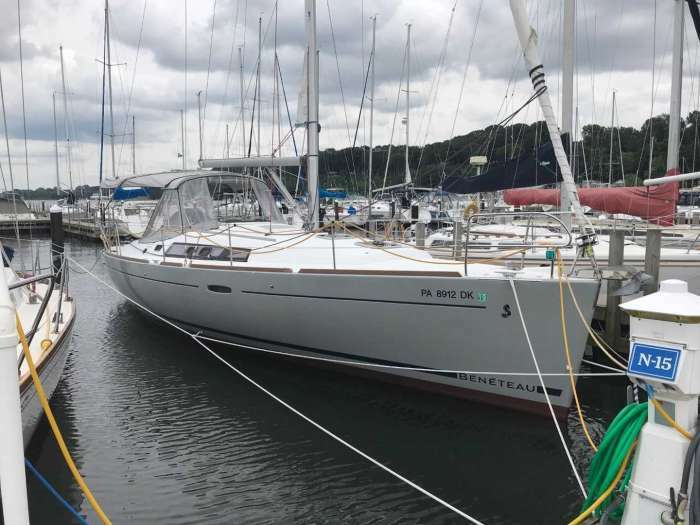 A good turnout and lots of people through to see our new Beneteau 41.1. Jim Egloff and his crew of John Bailey and Andy Harold hosted a nice customer appreciation party last night at our Youngstown marina. It was a great turnout and lots of food was eaten. Young and old in attendance with the young running all over the grounds chasing each other. We love the opportunity to see our customers all together at once. Sad but true, the first few boats have already been hauled for the winter. The summer flew by and seems to go faster each year that passes. Anyway, this is a reminder to get your fall and winter work submitted to your yard managers. Take the time to review your boat and how everything worked or didn't work. If you need something outside the annual work, its best to nip it in the bud and get it fixed before next season. Another annual reminder as we come into the fall storms. 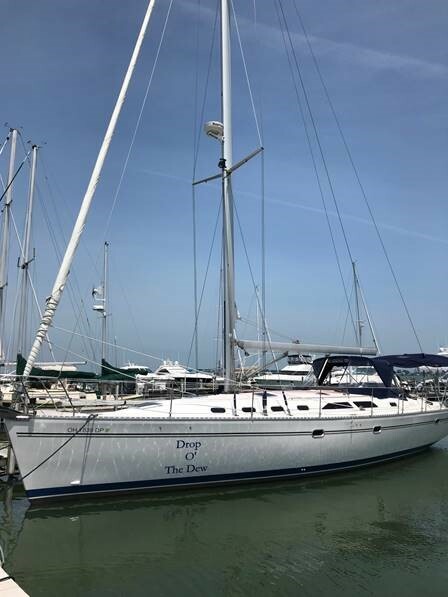 If your boat is still in the water, make sure you leave your boat tied tightly, fenders in the right spots, mooring lines tied with extra lines, extra sail ties, etc. Today was a good example with 40+ mph winds ripping across the region. October 13-14, RCR Buffalo Open House & Customer Appreciation Picnic: We host this every fall and it is something we really look forward to doing. 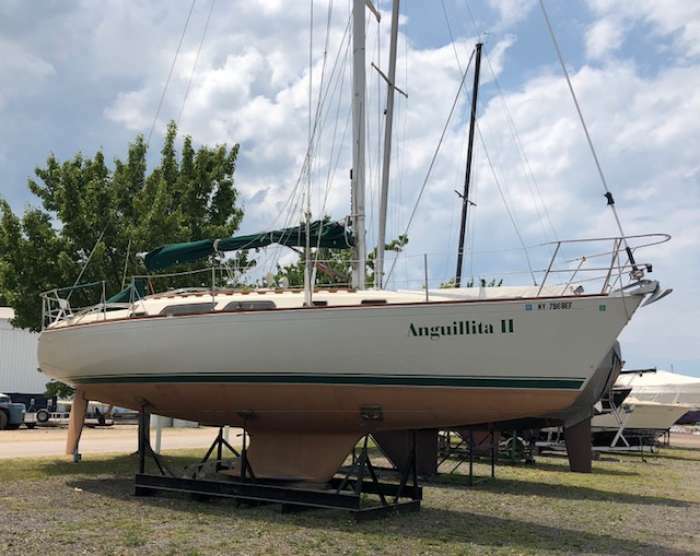 The marina is usually bustling with activity and customers come down for a late season sail, are in the process of putting thier boats away, or looking at the newest boats we have for sale. It is an opportunity for us to see and chat with you and share some food and refreshments. Mark your calendars now. Results of Outer Harbor Public Input Survey Now Available: Erie Canal Harbor Development Corporation (ECHDC) released the results of its Outer Harbor “Capital Planning Phase” public survey. The qualitative survey, which was conducted both online and in-person, was part of the agency’s first community meeting to seek public input for three projects focusing on access and the activation of over 150 acres of Buffalo’s Outer Harbor. View results of the survey here. 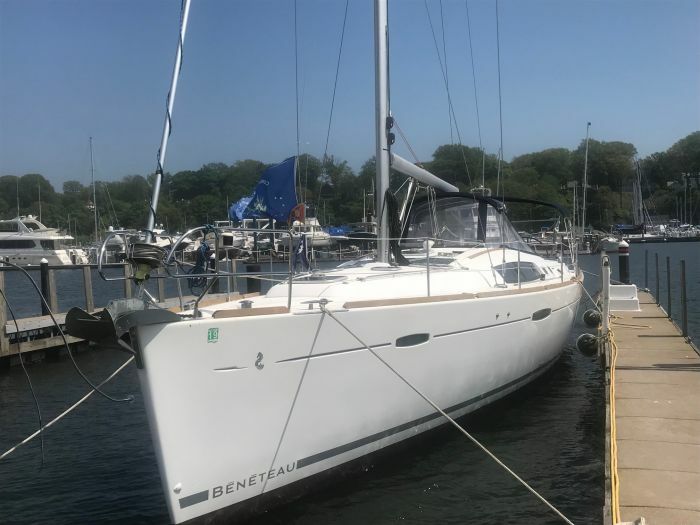 Beneteau pre launched their latest sailboats in Newport, RI. This occasion was ideal for Press and VIP Clients to attend this intimate and exclusive event. In addition, it was a great opportunity to meet the Beneteau’s Design Team who came especially from France. 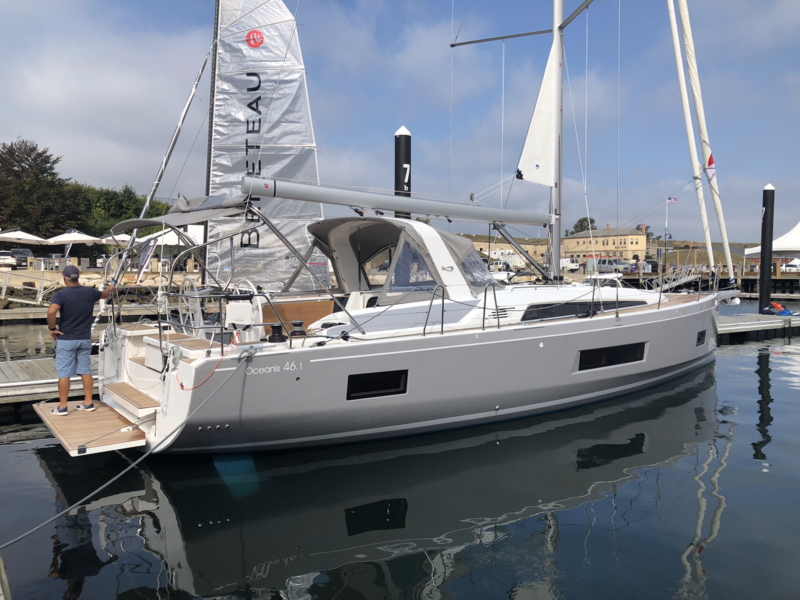 Beneteau gathered an impressive fleet of five newest sailboats: Oceanis 46.1, Oceanis 51.1, Figaro Beneteau 3, First 18 and First 24. All were in line to welcome over 100 people - worldwide magazine editors, dealers and VIP clients - at Beneteau’s Sailboat Launch Event from Tuesday September 4th to Saturday September 8th, 2018. 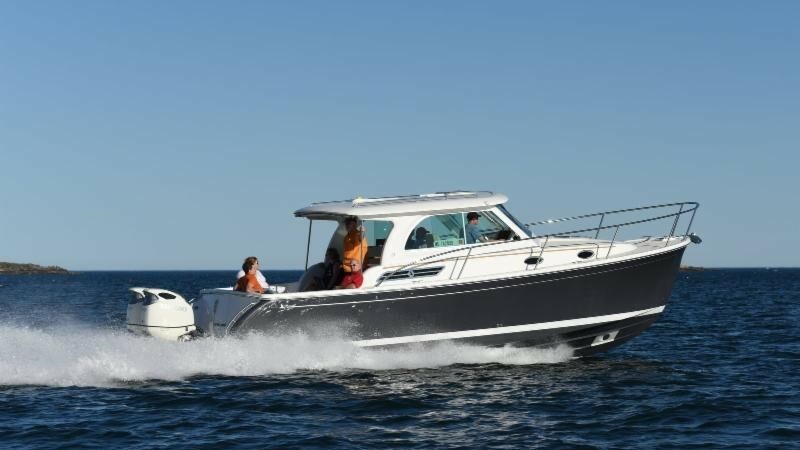 Corbo Test Drives the Back Cove 34O: A week ago Friday I had the opportunity to sea trial the new Back Cove 34”O”. 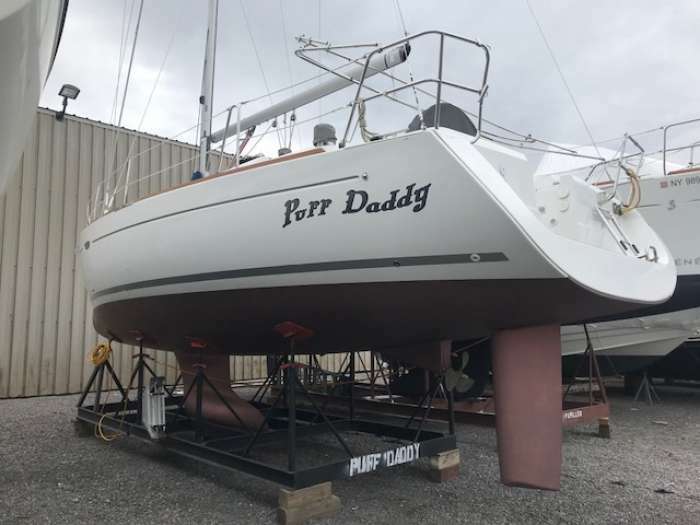 After three weeks of sea trials in Rockland by factory designers and engineers the boat was moved to Portland to stage for the upcoming Newport Boat Show. Back Cove decided to make the new design available to dealers to get brief hands-on before the show and said availability would be limited. I quickly called to make my reservation and was given an hour time slot Friday afternoon. Not nearly enough time, but hey, you take what you can get. We were at the dock early waiting for the boat to return... right on queue the new Back Cove pulled in but the occupants, two dealers and what looked to be a prospective customer, were taking their sweet time getting off the boat. Didn’t they know we were only allocated an hour? Leaving the dock the first thing that we noticed was how quiet the 300hp Yamaha’s ran. Seriously, I looked back more than once to confirm they were running, not sure why because we were moving comfortably through the water. New to me, the boat is equipped with the Seastar Optimus EPS (Electronic Power Steering) system, a programmable Drive-by-Wire system. Among other things this system can be programmed for different feel/resistance and the number of turns that varies by speed. The idea being you want a different feel and level of response when blasting around at 40+ mph than you do maneuvering at the dock. You can also program the range of engine motion. Another feature was the Zipwake Dynamic Interceptor Trim Tab system. Vertical “Interceptor” trim tabs that extend down vertically from the transom to a maximum depth of 30 mm are automatically operated to control pitch and roll. 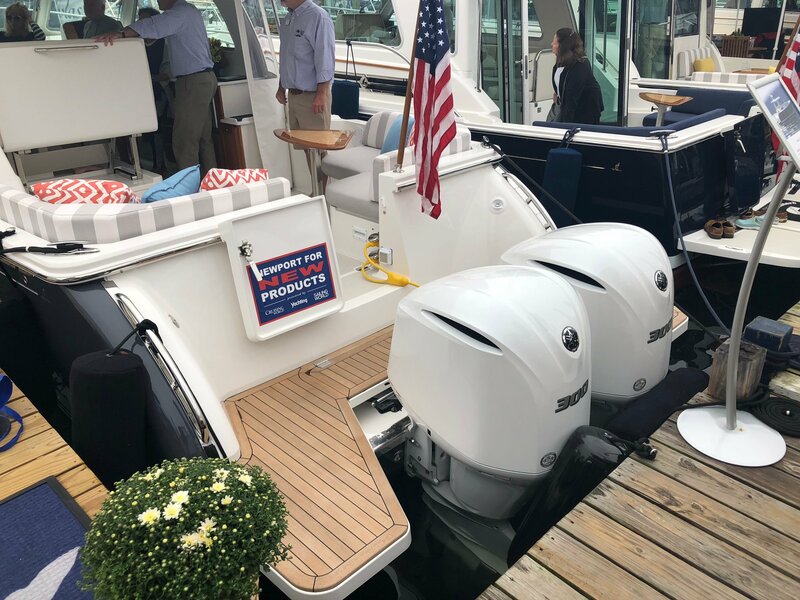 The system is fives times more responsive than transitional trim tabs, offer less drag and more lift to improve performance and better fuel efficiency. 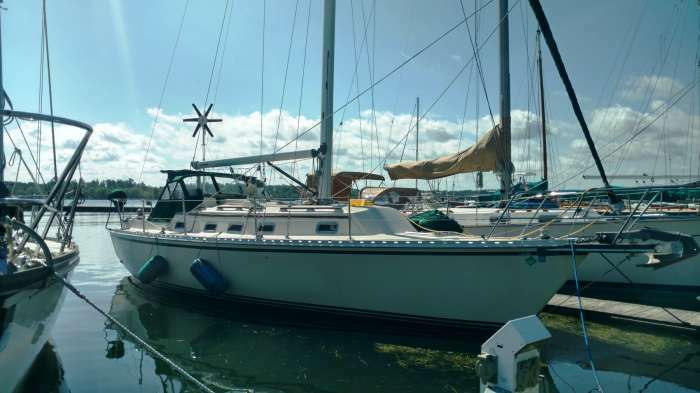 Again, completely automatic, turn it on and don’t think about again, and conditions change the boat will balance out on her own. As we entered Casco Bay we started to try things out. The boat was very responsive to both throttle and helm. The ride was very quiet and smooth. After some tight turns, acceleration tests and reverse maneuvers I cranked her up to see if performance number Back Cove rencently published held up. We found the boat jumped on a plane in a few seconds and didn’t take long to be running over 40 mph with the helmdeck quiet enough to have a normal conversation. The boat banked nicely into some tight turns and running over our wake was barely noticeable. All in all, very impressive. Before we knew it our hour was up and we had to return to the dock so the next guys could have their chance. 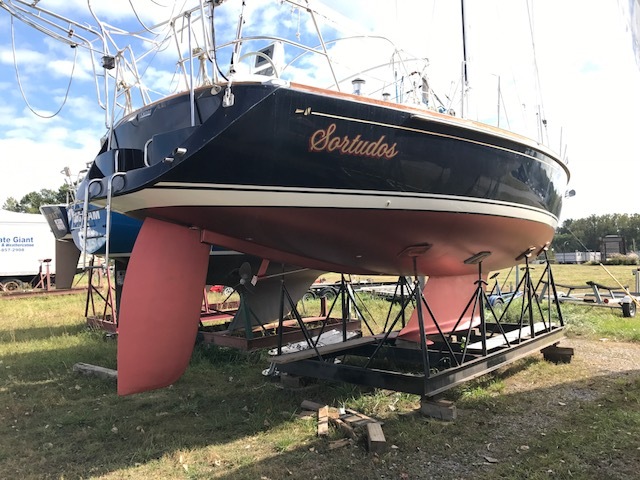 I wanted to back into the dock and found the maneuvered a little differently than my Back Cove 30 that was equipped with both bow and stern thruster. I hate to admit it, but it took more than one try to line up and successfully back in. I don’t think it will take much practice to get the hang of it. 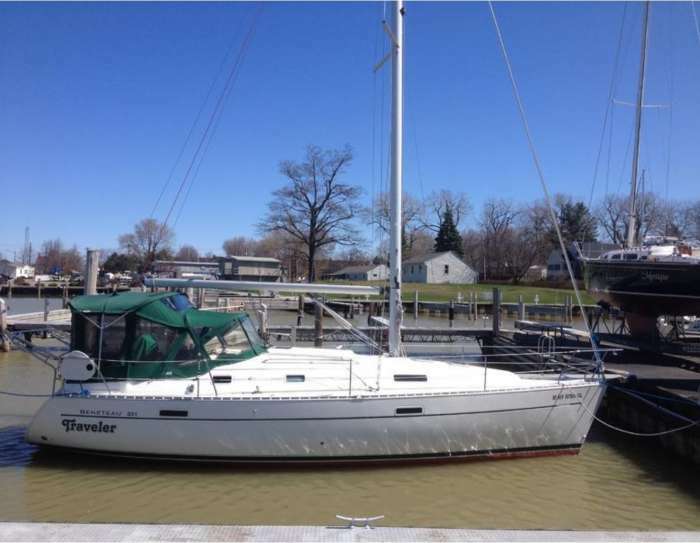 The trick will be figuring out when to use the bow thruster and when to use the engines to manuever in. On the ride home that night I was thinking how exciting I was to have a new Back Cove 34O coming for Donna and I next spring! But as drove down the road I also found many new question coming to mind about various systems and other parts of the boat I didn’t have time to explore. But that didn’t last long. The following week I got to send a couple of days on the boat with the designers and engineers from Back Cove Yachts at the Newport Boat Show. All my questions were answered along with hundreds more others asked. Very interesting to hear about the design process and the thought/considerations that went into each system on the boat. It became very clear to me that the designers and engineers at Sabre/Back Cove are tops in their field. 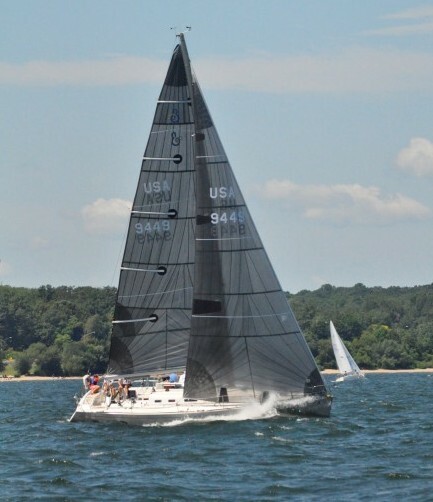 I left Newport with an even greater appreciation of our new Back Cove 34O. It’s going to be a long winter till the new ride arrives next spring! 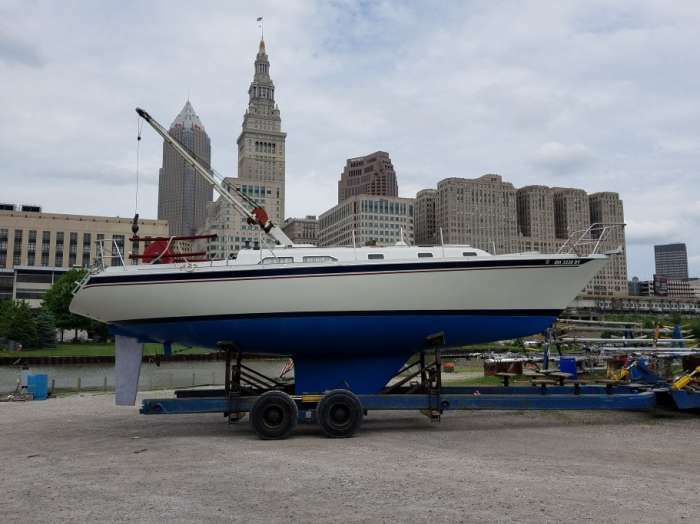 Cleveland Boat Show Report By Dave Regnet: The 2nd annual North Coast In the Water Boat Show was a great success. Perfect weather and great attendance made for a fun weekend. I have not been to downtown Cleveland in a lot of years and there has been a renaissance on the waterfront. The City Harbor was top notch and right next to the Rock and Roll Hall of Fame. If you’re looking for some place to cruise to next year Cleveland would be a wonderful option. A short Uber ride to the entertainment district with dozens of restaurants and bars and some of the best BBQ I’ve had in a long time made for a great ending to the weekend. I recommend walking back to the Harbor, it’s downhill going that way and after all that BBQ you will need to work off a few calories. Next year we will plan on going a couple of days early to explore the city further. 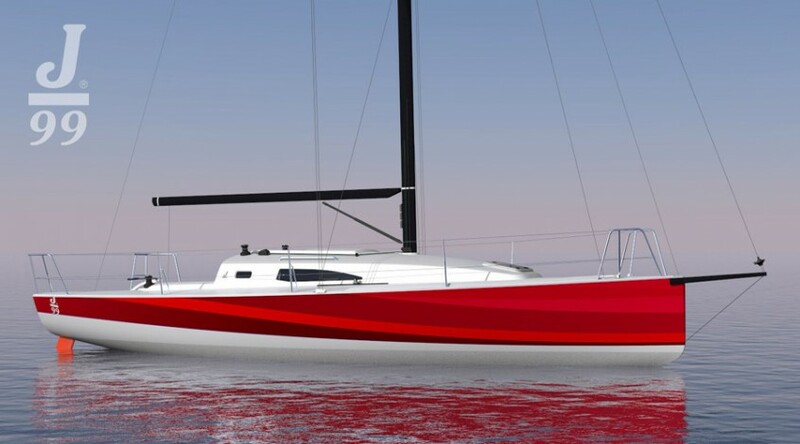 NEW J/99 from J/Boats: J/Boats and J/Composites are pleased to announce the new J/99, a 9.9 meter (32.9’) crew-friendly, offshore-capable speedster currently under development at J/Composites in Les Sables d’Olonne, France. 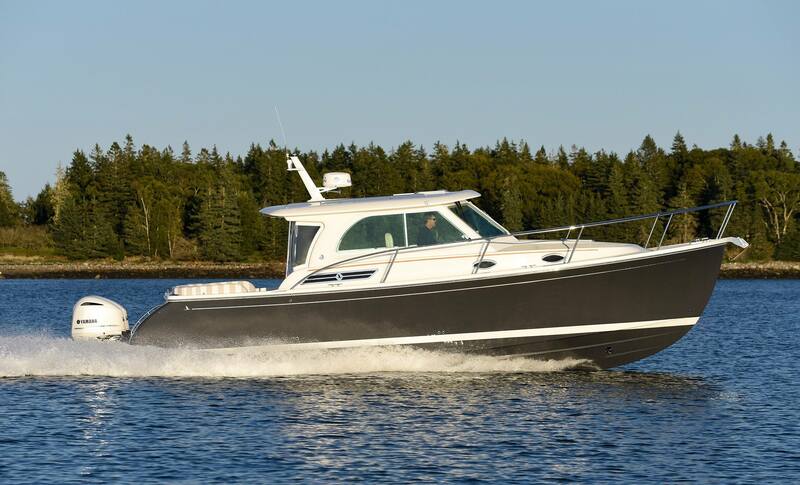 NEW Back Cove 34O "O" for Outboards: The Back Cove 34O will make her debut at the 2018 Newport International Boat Show. Her entirely new hull, fitted with standard bow thruster and designed specifically for outboard propulsion, offers cruise and top end speeds approximately 10 knots faster than the traditional single diesel engine Back Cove. 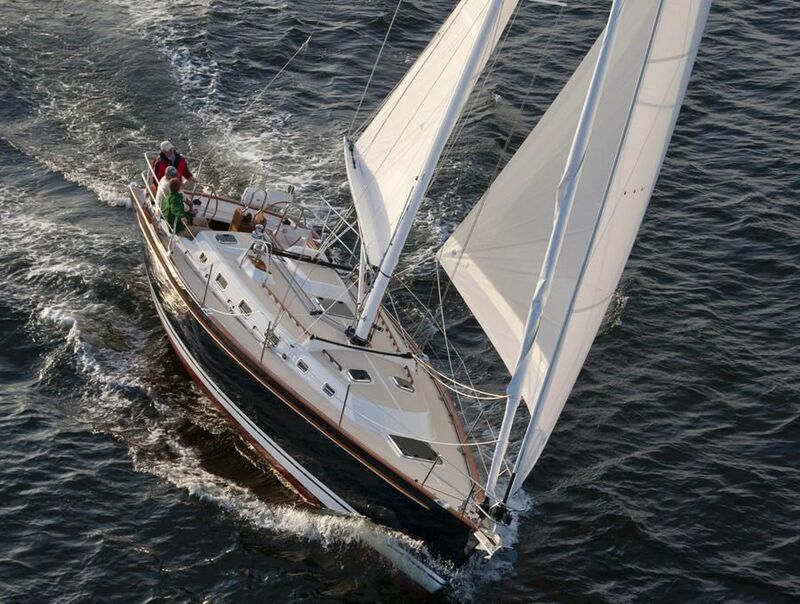 Corbo is headed to Portland Maine this week for a test ride on the newest member of the Back Cove family, the 34o. The "o" standards for outboard, this is the first model Back Cove has done with outboards, the rest of the line is all diesel-powered. We are super excited about this addition to the brand as it will open up a wider market for the product. 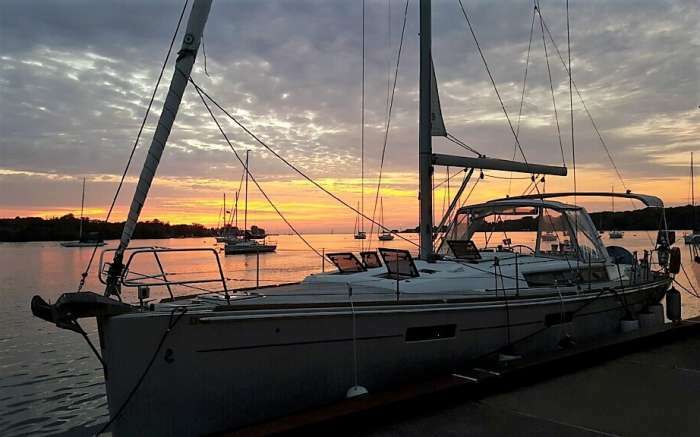 Back Coves are simply terrific boats, we can't say enough about how much we (and the owners) love them. 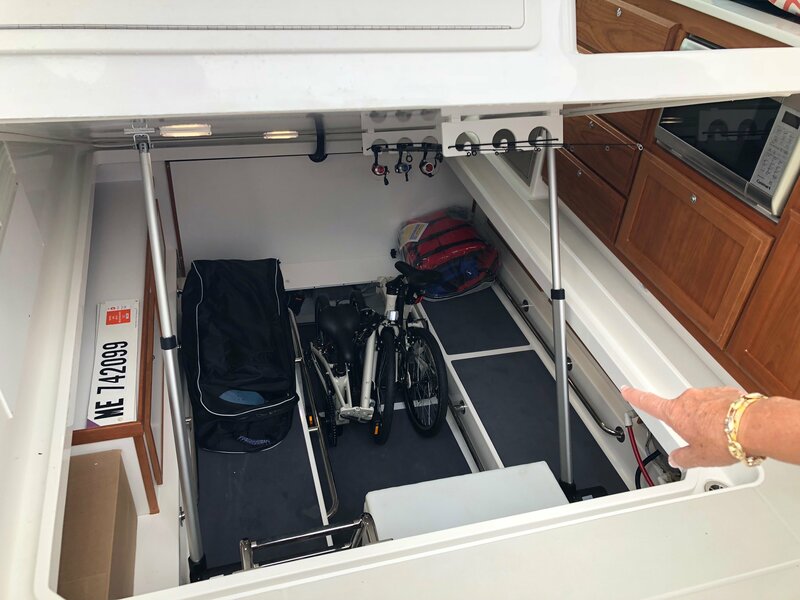 Now the line will have an option in this popular size range for those who prefer outboards while the diesel powered Back Cove 32 remains available with the same accomodation plan. 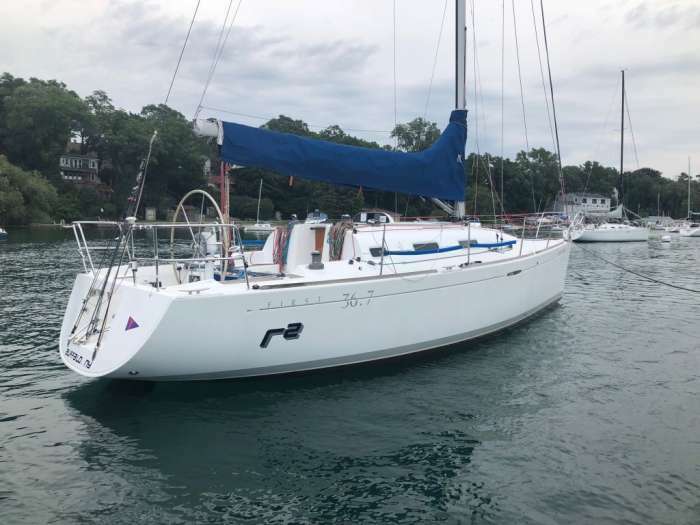 RCR has a new 32 coming in for stock in October, we just last week received a new Back Cove 30, and we have one 34o available for April. Back Coves are built in limited numbers and orders are generally are placed a full year in advance. Having one each of the 30, 32 and 34o available for sale for the 2019 season is the best lineup we have had in some time. The rest of the line consists of the BC 34, 37, Downeast 37 and 41. Beautiful yachts all. New Back Cove 34O with "Shark" colored hull running with twin Yamaha 300's. 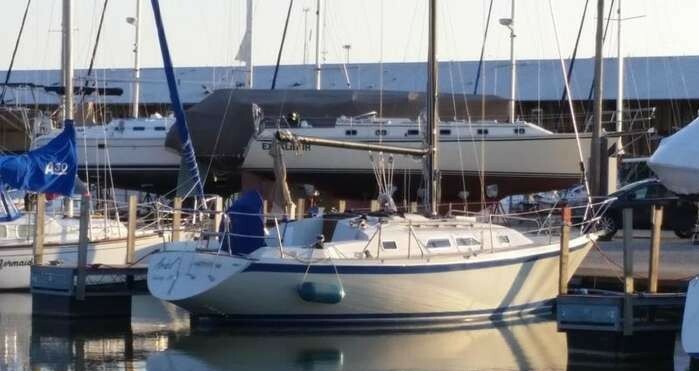 See ALL listings at www.rcryachts.com. They change daily! 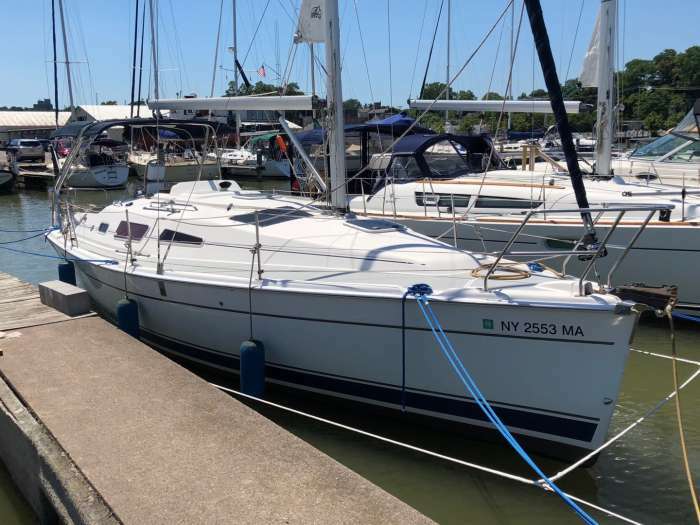 37' Beneteau Oceanis 37 2011 "Puff Daddy", one of our favorite Beneteau designs, good performance matched with comfort and features. 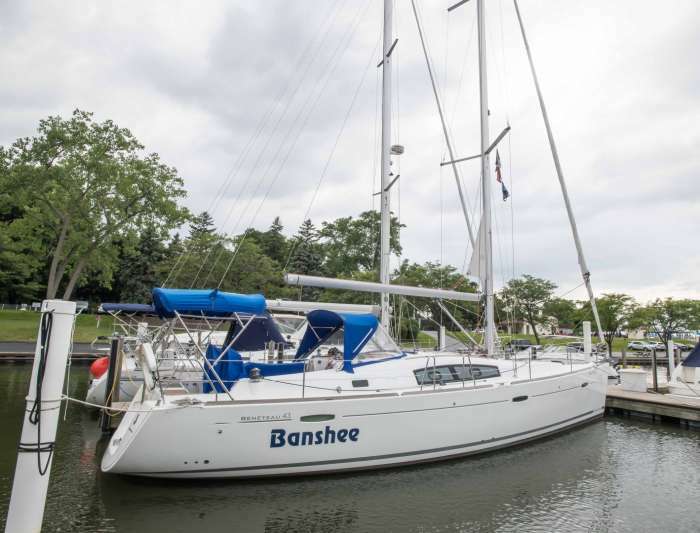 This boat is super clean and shows like new, comes with Air Conditioning & Heat, Electric Anchor Windlass, Nice electronics package with wide screen plotter, Autopilot, much more. Should not last long, REDUCED$139,900, Rochester. 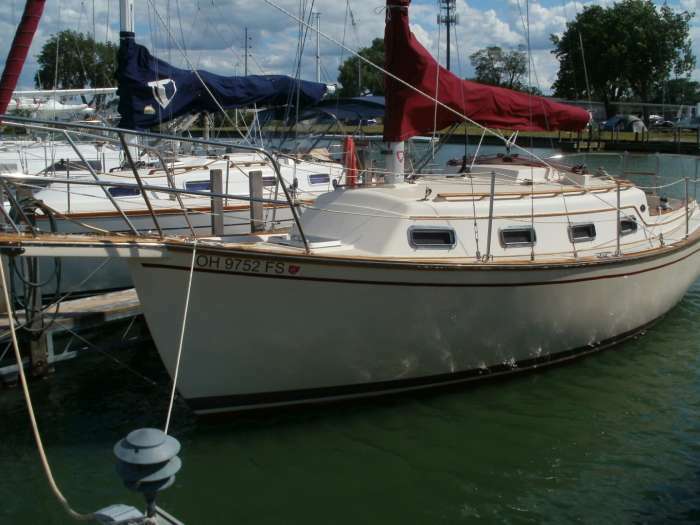 35’ Ericson 35 MKIII 1987 “QQQQ” Cleveland Heights, OH, REDUCED, $39,950 "Seller Wants Offers". 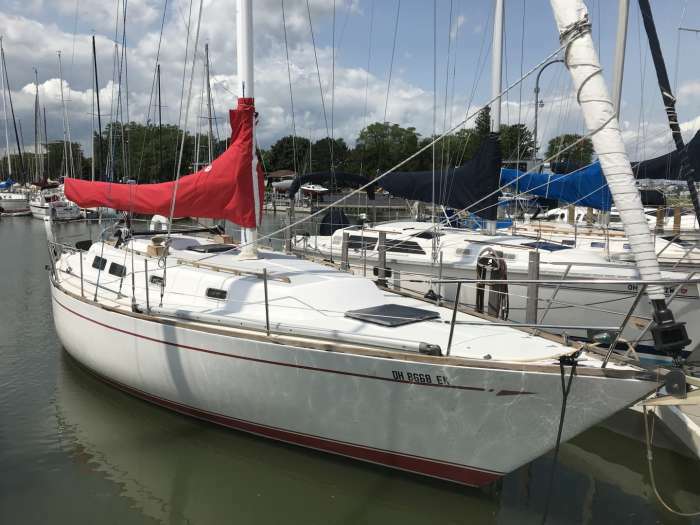 32' Jeanneau Sun Odyssey 32 2003 "Nepenthe" NEW LISTING 4’11” lead keel, roller furling Genoa and mainsail, 2 private cabins, in the water at Mentor Harbor OH. Wheel steering. Swim platform. Photos will be available late next week after detailing. $44,900. 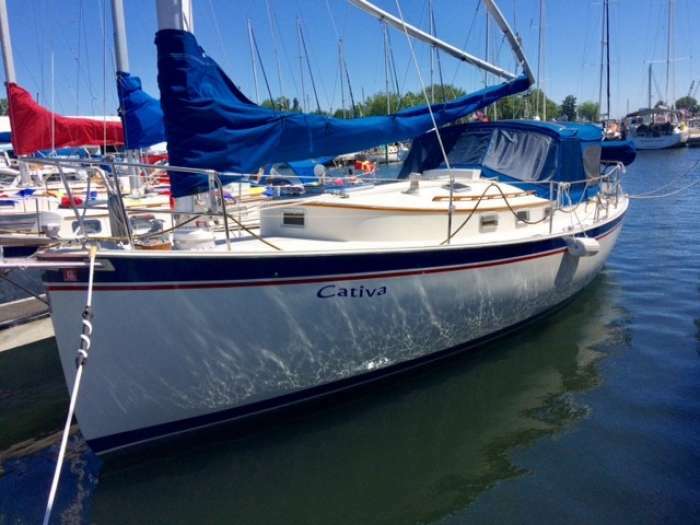 30' Catalina 30 - We have 4 to choose from, ranging from $16,900 to $24,900 and from years 1981 to 1987. Give us a call to find the right one for you.